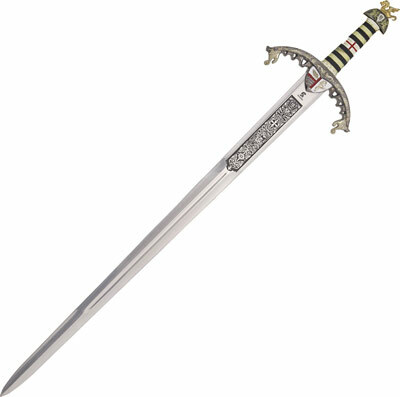 Richard the Lionheart Swords for sale are 43 inches in all. These Richard the Lionheart swords are made to honor the King of England and feature a beautiful and highly detailed guard and pommel. They are made in Toledo, Spain by Gladius and feature the famous Toledo steel. The 420-stainless steel blade has a fuller groove and is etched with handsome medieval designs. The blade features the Gladius logo and the Toledo stamp. The Richard the Lionheart swords have a black real leather handle with gold colored cord wrap. The aluminum pommel and guard feature an antique gold colored finish and medieval engravings. Buy these Richard the Lionheart Swords for only $199.99. Complete your display with laser etching services and wall mounts.